I went to Tanjay to attend to personal matters when I realized this is the home of the famous chocolate-swirled suman called Budbud Tanjay! I went to the market and bought a bundle. Price? P5/piece. It was even hot. Budbod Tanjay is sticky rice cooked in coconut milk and layered with a swirling of native chocolate, the tablea. It's a delicacy all over Negros. I thought about heading back home when it occurred to me that Bais, the next municipality (known for dolphin watching), is only about 5 km further up north. 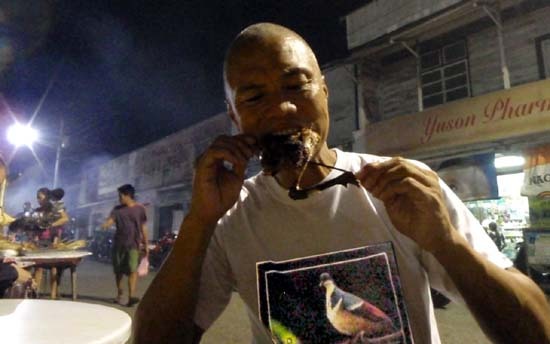 I remember my friend, Angelo Villanueva, who runs a newly opened cafe, Adeladiva Cafe just north of St. Paul University, telling me that Nene's Halo-Halo and the BBQ native chicken (locally called chicken bisaya) are a must-eat in Bais. It didn't take me long before I was walking the surrounding area of Bais Poblacion. Like Bacolod, Bais was built on sugar. It has the oldest sugar mill in the country, Central Azucarera de Bais. In Negros Oriental, the sugar hub is Bais, being the largest producer of raw sugar. It has seen its heyday during the 1930s when sugar was king - ancestral homes dotted the sugarscape and there was plenty for everyone. If the US had the roaring 20s, Bais had the heady 30s. While it has lost its prominence due to declining global demand for sugar and the emergence of sugar substitutes, sugar remains the staple industry in Bais, accounting for 26% of its agricultural output. Sugar cane can be seen left and right of the highway as it cuts through the city. While wandering around, I couldn't help notice that Bais retains a very strong Spanish colonial flavor. The prominent families in Bais are mostly of Spanish descent. Personally, I've met some beautiful Spanish meztisas hailing from Bais. Their city hall is conspicuously named "Presidencia de Bais". I also saw an eatery named "Comida de Bais". Bais struck me as an urbanized poblacion - it's got a huge plaza fronting the city hall, much like Valencia. It looked like the social hub of the town - students play frisbee, flairing, or just chill-out. It had a warm, friendly and laid-back feel to it. This is really what I came to Bais for. Now for the main event. It was easy finding Nene's halo-halo...everybody knew where it was. I ordered the special halo-halo for P50. It had a huge ice cream topping. Usually, it's ube flavor or vanilla. But this one was Rocky Road - strange for a halo-halo. Another unusual thing about it was it had no crushed ice. It was the usual filling plus a huge ice cream topping...hardly what I would call halo-halo to begin with. I found it sweet, heavy and thick. Overall, it was ok...something different. I would not go out of my way for it, but if you happen to be in Bais already, it's worth a try. Wanting to see more of the town central but with little time left, I flagged down a pedicab rider (it's a pedal-powered tricycle) and contracted to give him P25 to tour me around until the P25 is consumed. I already asked around what the usual commute rate is - P6/passenger, so P25 should be ok. I told him I wanted to see interesting things in Bais. I was thinking old churches, ancestral homes, ruins, etc. Instead, he took me to the newly opened grocey, a department store and the new market that was under construction. Yes, the word 'interesting' can indeed be subjective. I was still full from the halo-halo so I let it settle down with the tour. Now, it was time for the BBQ chicken bisaya. What's the big deal about chicken bisaya? Unlike commercial white broiler-type chickens, chicken bisaya is native free range chicken that's essentially self-supporting. It moves around a lot looking for food and so the meat is a little on the tough side and extra lean. It's never given any growth hormone or anti-biotics, so it's as organic as organic gets. An organic free-range chicken? The taste validates it. It's definitely more flavorful. Because it takes time for the chicken to mature (hey, no growth hormones! ), it costs a little more. The side of the new market was lined up with colorum chicken stalls and people crowding around, eager to order their dinner for the evening. The alley was thick with smoke from the grills lined-up by the vendors. The scene had this charming pedestrian and raw feel to it. Street food at its best! A thigh ranged from P35 to P50 depending on size. As expected, the taste stands out. There are also puso (rice packaged in woven coconut leaves) vendors for that carbo accompaniment. Bais is a charming place. I'm sure I've only scratched the surface. With its mangrove coastline, I'm sure there are good crabs to be had. But where? That's when local knowledge comes handy. With its heavy Spanish influence, I'm sure the best Spanish dishes are here too...Callos comes to mind...but in households...not restos. All I need to do is pencil-in when the next town fiesta is. take the Bacolod-bound Ceres bus at the Dumaguete Ceres Station. With parts of the highway getting fixed, it'll be dusty. Take the aircon bus...it's worth it! 45kms, less than an hour trip, fare around ~P55.00. if you're a big group, best to hire a van from Dumaguete to take you to Bais. ~P1400, 50 minutes.